Exhibition Organizer Deluxe is a flexible exhibition management software for Windows users. Our software gives you an easy way to plan, manage, track, and organize exhibition data. For the database novice, Organizer's intuitive interface and ready-to-use exhibition management solutions make it easy to set up and use. There is a set of useful functions that allow you to protect your exhibition data. Easy way to plan, manage, track, and organize exhibition data. ...... ..),exhibition contact information, exhibition location, exhibition cost, agenda in a free form, notes, user fields. 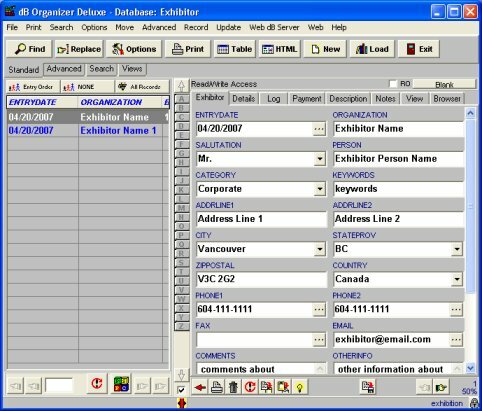 Exhibition Detailed : Complete database template that allows you to maintain and organize Small Exhibition information: exhibition general data (title, date, status, description,...), exhibition contact information, exhibition personnel, exhibition documents, exhibition location, hotel, other addresses, exhibition cost data, agenda in a free form, notes, user fields. Qweas is providing links to Exhibition Organizer Deluxe 3.7 as a courtesy, and makes no representations regarding Exhibition Organizer Deluxe or any other applications or any information related thereto. Any questions, complaints or claims regarding this application Exhibition Organizer Deluxe 3.7 must be directed to the appropriate software vendor. You may click the publisher link of Exhibition Organizer Deluxe on the top of this page to get more details about the vendor.